As well as serving customers, I was responsible for the five listening booths, putting on the records and locking up the machine. I also had to say to the customer “When you have heard enough I will come and take the record off the turntable.” The prices of the records were, singles 5 shillings and 7 pence, the LPs were between 12 and 15 shillings, (if my memory serves me correctly). At that time ‘Rock and Roll’ was the popular music of the day. Some of the titles that stand out in my mind, were Elvis Presley Heartbreak Hotel, Bill Hayley and the Comets Rock Round the Clock, these two were sold in their thousands. Other popular music of the time was traditional and modern jazz, light orchestral music like Mantovani and Latin American Edmundo Ross. Some of the popular shows were, Oklahoma, Carousel, South Pacific and Seven Brides for Seven Brothers. Apart from keeping up with the current musical trends, I also had to know about the classical composers and their works. There was a record library behind the counter, and we had to remember the number and where the different records were filed. If we did not have a particular record in stock, we had to order it, and write it in the customer ordering book. Upstairs on the first floor there was a sheet music department and the Keith Prowse Booking office for shows and operas at various locations. Also on this floor was a television/radio sales department and a piano showroom. 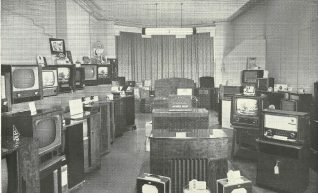 The television and radio service and repair department was on the second floor, and in the basement, a piano workshop. Rehearsal rooms were also available which celebrities used from time to time. Some of the celebrities that I remember, were Joan Hammond famous opera singer, Gina Bacheaur world famous pianist, Petula Clark the popular singer of the day, the famous Magician David Nixon, and Bill Owen the actor and comedian. I was there during the Centenary Celebrations (1856 – 1956) the original shop was in East Street Brighton, but in later years it was in Western Road. During those celebrations, I was in a special concert and at the age of 16, I performed Debussy’s Clare De Lune on the piano in front of an invited audience. Do you remember this shop, maybe you worked there or know someone who did? Did you buy your records here or maybe they fixed your television or radio? If you can share any memories of the shop please leave a comment below. You can read a history of the business from its origins here. Hallo Josephine. I wonder if you are related to Bessy and Molly? I have always loved classical music and, as a schoolboy in the 1960s, I found Lyon and Halls an oasis where they played the music I loved. Later I used to hire a Steinway piano at the top of the shop for a couple of hours. I was never a gifted player but they didn’t seem to mind. Happy memories! Thanks. I bought my first LP in this shop having just got a 3 speed radiogram (as they were called then). It must have been about 1954/55, when I asked what LPs they had, the girl serving me said they only had ONE, the rest were all 78s. It was a George Shearing Trio (not the quartet which was very popular at the time) 10 inch, I had never realised he made records as just a three piece group. I still have the LP in my collection, and I believe it is still available on some websites. My music teacher, Madame Vera Morrish, gave me extra pianio tuition at Lyon & Hall, Western Road, Hove, prior to entering me into the Brighton Co-Operative Music Festival and Worthing Music Festival. These were magical moments as we had the use of a beautiful grand piano which was a great improvement on the usual piano at home which she tutored me on. High marks at the two Festivals were the reward of attending these sessions every Saturday morning for many months. Sadly I have mislaid all the certificates over the years but still think of her as I pass the old Lyon & Hall shop on the way to Waitrose. She always gave me praise which resulted in confidence to get high marks. Dear Sandra, it was lovely to read your comments. Yes, Bessie is my Mum and Molly my aunt (both deceased). It was nice to read your article about Lewes Road Operatic Society. I knew your Mum and Dad very well. My aunts Peggy and Amy, also my cousin Marion and myself were also members of this society. Best wishes Josephine. My father (Robert F. Waller) was manager of Lyon and Hall in Western Road just before the 2WW: his trade was piano tuning. Recently I conversed with an alumnus member (President) of Old Varndean (Boys) School about the blind piano tuner who was well known in Western Road in those days. Dad was also at one time manager of the rival shop Murdoch’s. As a boy I remember appearing on stage (finale) in the Brighton and Hove Opera’s(?) production of Hiawatha at the Dome in the thirties; I have never been able to discover anything nor any others’ memories of this stellar performance (I was about seven and sold programmes dressed in N.A.Indian garb with head-dress made by Mum from turkey feathers from Sainsbury’s). My brother Eric Waller (ex Allen West and Royal Navy and Sussex U. Chief Lab Technician) five years older was also an Indian brave. One of Dad’s regular tasks for Lyon and Hall was on a Sat or Sun afternoon to appear at the Dome with the scheduled piano soloist to tune the concert grand to the performer’s liking. Dad’s favourite pianos? Bechsteins. A Brighton pre war ceremony every Nov 5th was to pile unwanted grand pianos on the beach between the piers and have a huge bonfire! Hello Josephine, I worked for L & H from 1955. 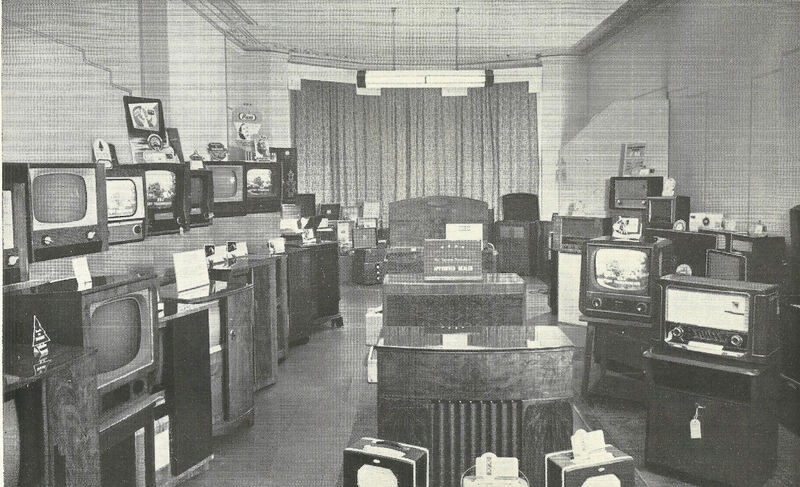 I was a trainee, (an “Improver” as they were called then) in the Radio Showroom on the first floor. It was my first Job. My boss was Mr Spry. I well remember Miss O’Sullivan in the record department. The listening booths. I bought many a 78 from there. Many famous people of the time were always in and out of the upstairs rooms, and you could often hear opera singers and pianists rehearsing. 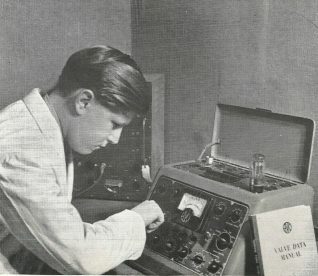 I think the pictures are great, I remember the Piano Tuner and the Lad in the Radio service Department using the valve tester I can well remember, but can’t think of his name. Although I don’t remember you we must have both worked there at the same time. An interesting time when you look back on it. Hello Josephine, I worked there for two years ’71-’72 in the piano workshop (basement) showroom and practice rooms as a piano tuner technician. 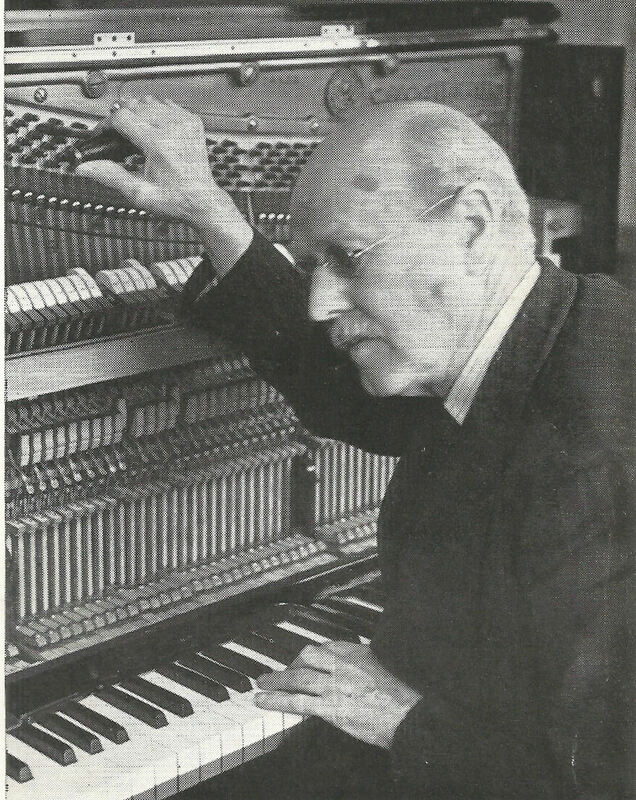 The manager of the shop was George Brown who had been a piano man himself. They used two blind independent tuners for local outside work, one of which I keep in touch with still. When George Brown died I left to start my own business as I had spent ten years with two shops. 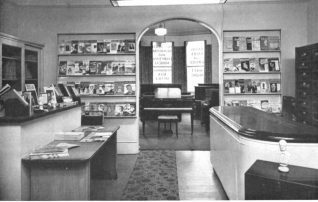 Seeing your pictures of the shop brought back many happy memories of my time there although the front of the show room had changed to allow an electronic organ department. I was told after I left the last piano I overhauled was purchased by Sir Laurence Olivier. 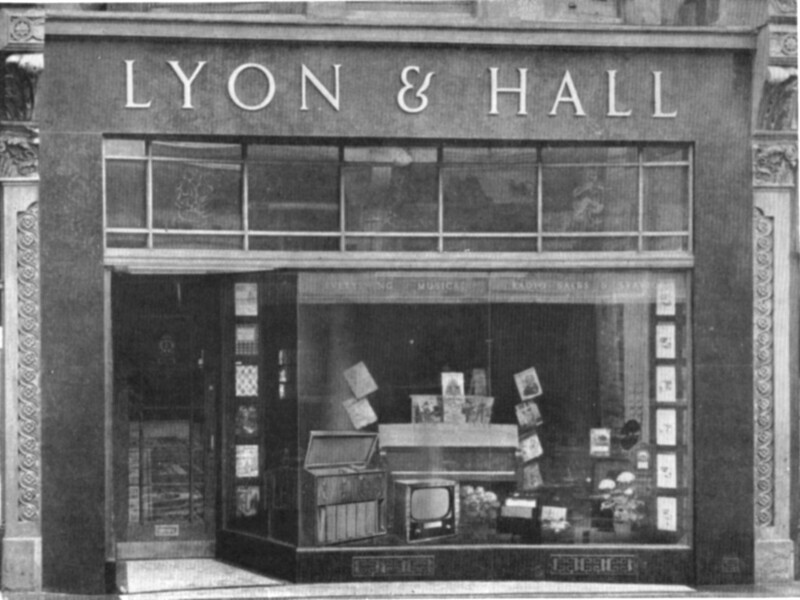 Does anyone remember which side of the road Lyon & Hall shop was located; north or south? Thanks. I think Lyon and Hall was located on the south side of Western Road, in the same block as Plummers – (Plummer Roddis), between Preston Street and Montpelier Road. I may well be wrong but that is where my memory visualises it. Hello Kath, Yes I think that as well, but I also seem to recall a record shop on the north side almost opposite Lyon & Hall, hence my uncertainty. Do you have any recollections of that? Question for Josephine. I often wonder if any of the G&S operettas were ever recorded, audio or video. I stopped all my contacts with the society when I became 15 and started out to work. I had other interests by that time. I am very curious whether there are any recordings that you may know of as you maybe continued with the company longer than I did. I no longer have any contact with anyone else from that era. I remember your family members very well indeed. I was attending rehearsals with my parents from the age of three so I have a strong memory of many of the people that took part in the shows. As a tiny tot I was obliged to address everyone as aunty and uncle so this is how I started my musical engagements. So people like Aunty Amy, Aunty Molly, and Uncle Bob, were all very kind to me and often complimented me on being able to sit a whole evening while rehearsals went from strength to strength. This all began for me in 1949. A long while back. Would love to hear from you if you have time. The record shop opposite Lyon & Hall was Murdoch’s. Hi Josephine, I started as an apprentice to the radio department (TV followed later) on the 8th of August 1955 aged 15. I was the youngest of the five apprentices – one taken on each year on a five year apprenticeship. As at the centenary I was the youngest member off staff so my photo was published in the celebratory book along with the oldest member, the piano tuner. I remember Alan Drake by name. I have great memories of my five years there and people like Billy Williams who managed the sheet music department, and if my memory serves my service manger was Ron Bravery followed by John Black, and also Mr Ashby who was the radio store man. I can remember one Saturday when all the listening booths were full and with queues waiting I was sent to repair one of the machines and under pressure I cut a wrong cable causing all the machines to come to a halt and a good part of the lighting, plunging it into darkness. I was in great trouble with Miss O’Sullivan. They were great days which I will never forget. Hi John, great to hear from you with your news about your time at Lyon and Hall. It all adds to the history, it was lovely working there, although Miss O’Sullivan was very strict. The Christmas before I left in 1960, she gave me a brooch, in the shape of a little dragon, she said this will remind you of me! She laughed. I worked for a short while at another record shop called Edwards. Then I went to open a new record shop at Kemp and Turners Portslade. Hi Josephine, my father Douglas Brand was a television and radio repair man for Lyon and halls from the 1950s. He went on to be the service manager after the introduction of colour tv. I worked there on Saturdays in the late sixties. Does anyone who might have been there late 1940s-50s, remember a lady called Doris Pettit? She was my Auntie. I remember she had a small TV she purchased from the shop and in 52 when the King died, and 1953 when the Queen was crowned, we watched on her set. I would like to know if anyone remembers her. Thank you. Hi Valerie, I worked at Lyon and Hall, from April 1955 to 1960. I Knew Miss Doris Pettit, she was the secretary to L & H, Miss Cheeswright was the Managing Director. I have a souvenir Book of the Centenary of Service to Music lovers 1856 to 1956! in which is a picture of your Aunt. I played Clare de Lune at the Centenary Celebrations. Hi Peter, I remember your dad so well as he helped to train me for five years. I left a suitcase at his place in Grand Parade and used his address to enable me to get married in St Peter’s Church in 1961. He and Alan Luff were the two outside engineers. As I had the honour of being the first person allowed to learn to drive in one of their vehicles I am sure that I would have given him some nightmares. Peter, I also remember working with your Dad Doug Brand. I started working there in 1972 as the ‘Saturday Boy’, and joined full time in 1973 as Organ and Piano Department manager. I was there until the fire and closure in 1975. I used to spend about an hour, on Saturdays, in Lion and Hall’s. This was the early 60s and I was learning to play the piano. There was so much to look at, from huge concert grand pianos to loads of smaller items. When I could afford it, I bough a ‘miniature score’. This was the full score of a classical piece, published in a small, paperback, format. I would take one of these home and read the score while listening to the few classical records I had. Other items that I always enjoyed looking at were conductors’ batons, busts of famous composers and lots of sheet music. I even bought a baton and ‘conducted’ my records at home (no, really!). Soundproof booths, alongside of the shop enabled you to ask to hear a record that the shop sold. You could outstay your welcome on this front and I think you were only allowed to listen to one or two. A beautiful shop.